I have often shared with you the astounding new revelations I receive when re-reading familiar Bible passages. In my ongoing deep dive of the Bible, I have arrived at John, Chapter 6, and the well-known Scripture concerning Jesus walking on water. I had already read the version of this same story in Matthew, Chapter 14, and in Mark, Chapter 6. But I was taken aback at the different tone with which John is rendering the facts. The preceding verses had just told us about Jesus feeding the 5,000 near the Sea of Galilee. Then in verse 15, the Bible says, Then Jesus, knowing that they were going to come and take Him by force to make Him king, withdrew again to the mountainside by Himself. Wait a minute! I don't remember anything about the crowds forcing Him to be King in Matthew or Mark! In fact, Matthew just records that He simply "sent the crowds away", while Mark says only that He "dismissed the crowds". So what is John trying to tell us about this event? What I quickly realized was that I needed to kind of boomerang between all three narrations to get the full picture of what happened that day prior to Jesus walking on the water. When you look at all three versions of the feeding of the 5,000 you can see that Jesus spent the entire day healing the sick (Matthew 14:14) and teaching them many things (Mark 6:34). The day was nearly done and evening was coming on when the Disciples asked Jesus to send the people away so they could go find something to eat. 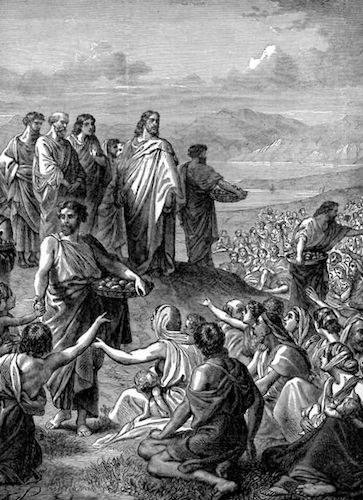 But Jesus said to them, “They do not need to go away; you give them something to eat!” But the Disciples were confused and did not know how to accomplish this task, so Jesus looked up to Heaven, giving thanks to the Father, and proceeded to feed the 5,000 with five loaves and two fish. So, how do we come to Jesus withdrawing by Himself out of concern that the crowd was going to force Him to become King? Think about this for a minute ... All day the crowd had been witness to miraculous signs of healing and profound teachings that had come to them as though His words were the voice of God. Now, they see the crowning miracle of the day with the feeding of the 5,000, and they are convinced they are seeing the Messiah [whom the Prophets had spoken of] come into the world. Surely, if He can do all they have seen that day, and speaks with such authority, He can rid Judea of the hated Romans and deliver Judah and Jerusalem into the Promised Land the Israelites of old had sought. Jesus could feel the hopes of the people rising to a fever pitch. They see Him as a different leader than the Jewish priests and rulers, and they are eager to force Him to become who they believe He is, the Messiah and Deliverer of Judah. Yet, He appears too modest and does not seem inclined to assume His role as King of the Jews. Even the Disciples agree with the crowd, hoping that the swelling and popular movement to place Him on the throne would at last entice Him to make His move. But Jesus discerns what is happening and understands that to preempt His Father's plan would result in violence and insurrection, and the spiritual work of the Kingdom on earth would be hindered and obstructed. He must stop this movement in its tracks! In Mark, Scripture says that Jesus "immediately insisted that His disciples get into the boat and go ahead [of Him] to the other side to Bethsaida, while He was dismissing the crowd. And after He said goodbye to them, He went to the mountain to pray". The fact that He had to insist they go ahead of Him seems to imply there may have been some protest on the part of the Disciples. Perhaps they didn't want the crowd's enthusiasm [for Jesus to take the throne] to go to waste, and were reluctant to let this opportunity slip away. But Jesus spoke with authority [and foreknowledge of how He must play out His assignment] and commanded them to go to the opposite shore. So what was Jesus praying about while up on that mountain by Himself? The Bible doesn't tell us, but I don't think it is wrong to think that He might have prayed for the people to recognize the Divine character of His mission; that they could see beyond the earthly ramifications of a crown and a throne. And I don't think it's wrong to imagine that He prayed for His disciples, that they might endure their dashed hopes as they witnessed His crucifixion, instead of His placement on the throne of David. Perhaps He prayed that they would be able to resist the temptations of the Enemy to dismiss all that He had taught them, and that they would embrace the truth that His Kingdom was not of this world, and it was to be their calling to share [with the world] all that He had taught and commanded them. And we can only imagine the thoughts of the Disciples as the wind was literally let out of their sails, as they rowed across the Sea of Galilee. I find it interesting to examine the writings of Ellen White in her book, The Desire of the Ages, "They had left Jesus with dissatisfied hearts, more impatient with Him than ever before since acknowledging Him as their Lord. They murmured because they had not been permitted to proclaim Him king. They blamed themselves for yielding so readily to His command. They reasoned that if they had been more persistent they might have accomplished their purpose... They knew that Jesus was hated by the Pharisees, and they were eager to see Him exalted as they thought He should be. To be united with a teacher who could work mighty miracles, and yet to be reviled as deceivers, was a trial they could ill endure. Were they always to be accounted followers of a false prophet? Would Christ never assert His authority as king? Why did not He, who possessed such power, reveal Himself in His true character, and make their way less painful? Why had He not saved John the Baptist from a violent death? Thus the disciples reasoned until they brought upon themselves great spiritual darkness. They questioned, Could Jesus be an impostor, as the Pharisees asserted"? So as they ruminated while they rowed the three-plus miles across the lake, a storm snuck up on them and they were unprepared for it. All their impatience with Jesus was gone, and they found themselves in a fight to keep the boat from sinking. In fact, they entered the boat at evening, but Mark 6:48 says they were straining at the oars during the fourth watch of the night (from 3 am to 6 am) when they saw Jesus walking on the water towards them, so they fought the waves and wind for quite awhile. They were terrified, and so they could not discern that He had never taken His eyes off of them. He knew they were to bring His Light to the world, and was not about to let their stubborn hearts or unholy ambition [regarding Him] swamp that boat. And when He acts like He is going to pass them by, they cry out for His help, and He identifies Himself [as the I AM] and bids them not to be afraid. Note that only Matthew records the episode of Peter walking on the water. Only Peter has the courage to question Jesus if it is really Him, and says, "If it is really You, command me to come to you on the water". Jesus says, "Come", and keeping his eyes fixed on Jesus, Peter walks upon the surface of the water! But when he took his eyes off Jesus, and starting looking at the effects of the wind and the waves, he begins to sink, and cries out "Save me"! 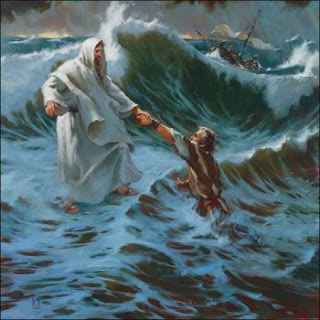 But Jesus immediately reaches out His hand and catches Peter from sinking beneath the waves. And what does He say to Peter? "O you of little faith, why did you doubt?” I believe that question is at the heart of so many unfulfilled Christian lives. So now I ask you, how often have you reacted the same as the Disciples? How many times have you predetermined who you wanted Jesus to be, or how you wanted Him to take action in your life -- and then been disappointed when it didn't turn out how you hoped it would? And how often, when confronted with a frightening episode in your life, you begin [like Peter] with staying focused on Jesus and His promises, and then the effects of the storm in your life draws your attention away from Him, you take your eyes off Him, and the next thing you know, you are drowning in fear and doubt? And, finally, how often do you dismiss the supernatural in a life that is in relationship with Jesus -- or are you even willing to accept His healing or His supernatural provision? We can learn a lot from this familiar episode in the life of the Disciples and Jesus. When we keep our focus on Jesus and are willing to receive the Truth of what He did in John 6 on that mountainside near the Sea of Galillee -- His healing, His teachings and His supernatural provision -- then He can do the same great things through us. When you step out in faith (like Peter did upon the water), you will be able to do things you could never do on your own, and your life will be a living testimony of what the Kingdom life is like on earth. That's how Jesus intends us to live! Are you willing to trust Him? Again, these are such encouraging words! "You Feed Them" or "You Do ____" (fill in the blank) is what I've been trying to tell other Christians Jesus wants us to do.... not simply always asking Him to do the work. As Scripture says, "GREATER works shall YOU do"! It's time the Body of Christ quit limiting their Christian walk to prayer only, and start actually WALKING! So in my life this is interesting. Most days I am willing to trust Him in really big Kingdom ways, then some days I walk around with a headache because I don't have enough trust or faith to command healing in His name. Those days are becoming fewer and fewer, hopefully at some point I won't have them at all. I sometimes blame it on my humanness, but I think that is just an excuse to not work harder. Trusting Him must become a way of life, and in my experience that has taken me some time. But, I have hope because even the disciples had weak moments. Absolutely, Trust is a journey! And the fact that you have not abandoned the seeking of it, tells me that our Lord will honor your obedience. And yes, stories like this one show us that we are no different -- or less -- than the Disciples. Jesus can use ordinary people, even with all their faults and weaknesses, to advance the work of the Kingdom. We just have to have a willing heart. In my walk with Jesus, I have grown more and more to trust Him. But, I know this to be a thing I still need to work on. In a recent meeting, I was listening to the Holy Spirit and He said to me, "Oh, my doubting Thomas. Child, just have faith. Just listen with your heart. Be still and listen, then act!" While my faith is strong, it isn't fail proof. But, I am working on it. Thanks, Pam. You always have a way of helping us to think through these challenges. I heard a podcast today that I think relates specifically to you ... we are all familiar with the Biblical saying, "faith like a mustard seed". But it doesn't mean faith that is as small as a mustard seed, but instead refers to faith that ACTS like a mustard seed. In other words, it is faith that starts small but grows big. The average mustard plant is 4 feet tall, but there is a species in Israel that range from 10-15 feet tall! So, in confirmation of what the Holy Spirit told you, the more you ACT on your faith, and out of your faith, the more your faith will grow. You are on your way, my friend! Bless you for having ears to hear, and the willingness to act on what you hear!